I had confirmation from FDC yesterday evening that approval has been given to mark the end of operation from Ilfracombe depot. I believe I am correct in saying that Ilfracombe is the last operational ex-Tilling depot in Devon. The hope is that the final duty at Ilfracombe (Duty 1116) will beoperated by a heritage vehicle. Approval has also been given to position two further heritage vehicles at Ilfracombe depot for the day to provide some photo opportunities and to provide space for a small display commemorating the history of the depot. Members of this group will be aware that there has only been a limited amount of time to mark the closure and consequently it has not been possible to advertise the plans in advance. I am still finalising arrangements, but the proposal is that the heritage vehicle will operate duty 1116 in its entirety. The duty is scheduled to book on at1450. This will therefore involve operation on route 3 (Barnstaple -Ilfracombe), one complete round trip on route 30 (Barnstaple - CombeMartin) and a short working on route 1 between Barnstaple Bus Station and North Devon District Hospital. The vehicle is scheduled to run into Ilfracombe depot for the last time at 2350 on Saturday March 31st and the duty books off at midnight.The vehicle will be crew operated, and it is proposed to issue some commemorative Western National Setright tickets. I am also hoping to have available some commemorative booklets to mark the closure for those that would like to come along.I will give more details in the next couple of days, but for now I hope this will allow anyone interested to lay some plans as I appreciate that the following day is the Cobham Rally and many will be making plans to attend that already. This was primarily intended as a way of marking the closure of a depot that has given long and loyal service to the bus and coach community inthe area, but we would welcome the presence of enthusiasts who might like to see a traditional Western National vehicle back working for its living in Ilfracombe for one final time. Duplicate car 15 on the 1500 Ilfracombe - Barnstaple service 3.Car 45 (normally rostered as a Vario) will be stood down to be transferred to Barnstaple depot at 1710. 1056 will take over this carworking as the 1710 Barnstaple - Combe Martin via Muddiford. It will then work the 1830 Combe Martin - Ilfracombe Bus Station.There will then be a meal break between 1902 and 1955 and the vehicle will be available for flash photography. 2000 Ilfracombe - Barnstaple service 3. 2045 Barnstaple Bus Stn - North Devon District Hospital service 1. 2055 North Devon District Hospital - Barnstaple Bus Stn service 1. Ilfracombe - Barnstaple Bus Stn service 3. 2310 Barnstaple Bus Stn - Ilfracombe service. The vehicle is scheduled to arrive at Ilfracombe at 2350 where it is hoped the last rites will be performed by a group of past and present Ilfracombe depot staff. The vehicle will overnight in Ilfracombe depot before returning to Plymouth on Sunday arriving back there by 1600. Agreement has been reached with FDC to work this operation intraditional style (e.g. with heritage uniform and a Setright Speedmachine will also be available to issue souvenir tickets for those interested.) 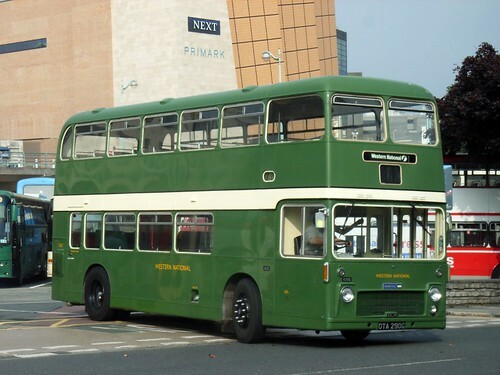 It is also hoped to have two other 'heritage' vehicles with Ilfracombe associations present at Ilfracombe together with a small display reflecting the history of bus and coach operations in thetown and at the depot during the day. More details on this later. Please feel free to pass the word on to anyone who may be interested.We hope to see some enthusiasts there to mark the passing of the last Tilling shed in Devon with direct links to its past (I appreciate that Seaton is still in use - but not in the ownership of an operator directly linked to its past).